Shirts With Random Triangles: Kliff Kingsbury predicts riot in Brazil following soccer team's World Cup loss to Germany on Twitter. 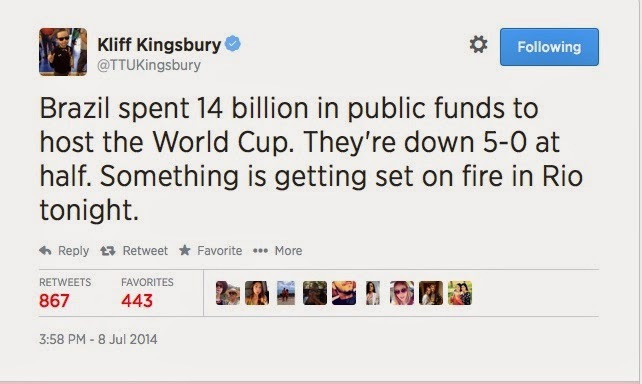 Kliff Kingsbury predicts riot in Brazil following soccer team's World Cup loss to Germany on Twitter. Texas Tech head coach Kliff Kingsbury tweeted out his reaction to the 2014 World Cup semi-final game between Brazil and Germany. Currently, Germany is destroying scoreless Brazil, having scored five goals in the first half. Here's a screengrab of the tweet, as I have a feeling it will be deleted sooner than later. And no, Red Raider nation, this is not an excuse for you to react badly when Texas beats you this season.